6 Natural Sounds & FM Radio — 6 natural sounds such as pure music, birds, forest, waves, beeping and so on, which let you revel in the sounds and smells of the nature. As well as FM radio, if you don&apos;t want to wake up, you can choose your favorite sound. 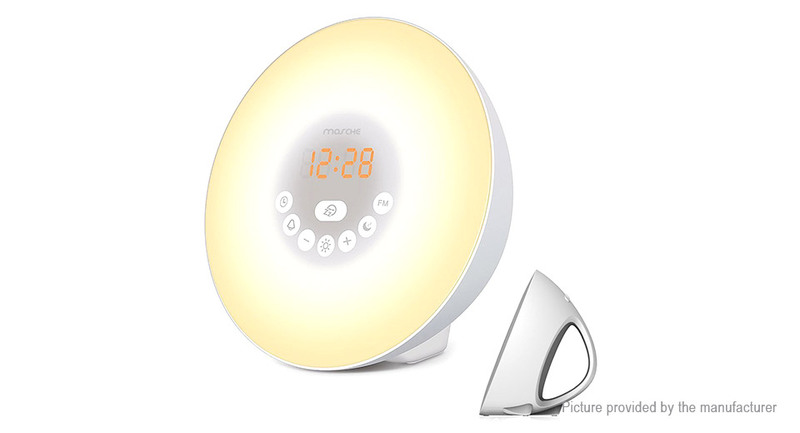 7 Colors Light & Mood Light Mode — Choosing your favorite color light: warm white/green/red/blue/purple/orange/indigo. And 10 adjustable brightness settings as a bedside lamp to protect your eyes. 3 Charging Methods — Power this useful gadget with a USB charger(Only power this device) or a wall jack, there is an option to use back up 3*AAA batteries (AAA batteries Not included). We suggest that using the batteries and the USB cord together in case of resetting the time when the cord gets disconnected.